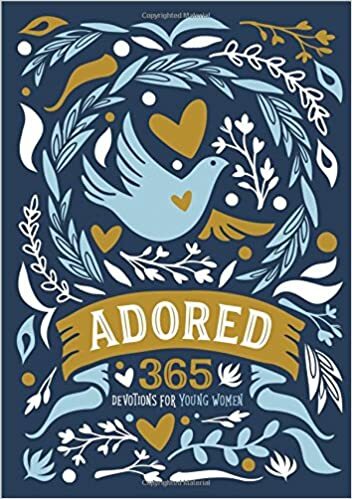 I excited to tell you about a new devotion from Zondervan - Adored: 365 Devotions for Young Women. Adore offers 365 devotions that address tough topics that young women face including self-worth, patience, bullying, friendship and dating. Each devotion is designed to remind the reader how much God loves and adores them. The 365 readings are short and probably will not require more that five minutes to read. A lot of the devotions start with a question that could be helpful in guiding the reader a bit more. Adored was written by Lindsay A. Franklin and illustrated by Micah Kandros. The book is hardbound and includes thick pages that have borders in blue, gold and white. In addition, each page includes a journaling area for further reflection. The scripture verses are based on the NIV Bible. I love the fact that each day goes by a number, instead of a calendar date. Using a number instead of a number makes this devotion a perfect gift for anytime of the year (i.e., Christmas, birthdays, graduations, etc.). My only criticism of this book is that it may be more appropriate for women who are in their 20s and not teens. In addition, this book may not be appropriate for women who are just starting their walk with God since it requires the reader to be familiar with several Bible accounts. You can see what I am referring to and try out a free 7-day download of these devotions here. P.S. Be sure to enter to win a copy of this book below. 1 John 3:1. I am called his child.